Rarely will I set an alarm on a Saturday morning, it is usually only reserved for popular brunch spots. And so it was with Smith, not only were we aiming to get there before the brunch crowd, but we also aspired to land a spot on the patio, voted best patio for brunch no less. We got there just after 9am and the place was still opening, still as we rounded the corner to the back patio I was a little bit nervous. Had I woken up early for nothing? Could I have kept sleeping?! My worries were all for naught, we had first choice of all the seats on the patio. Unfortunately, having not had my morning coffee just yet, I sat down closer to the entrance. Only after I sat down and looked around at the whole patio did I notice the upper section of the patio. But a large group later showed up and were told to sit there so they could all be together, I don’t feel remiss. We had already looked at the menu beforehand so we knew what we were getting. 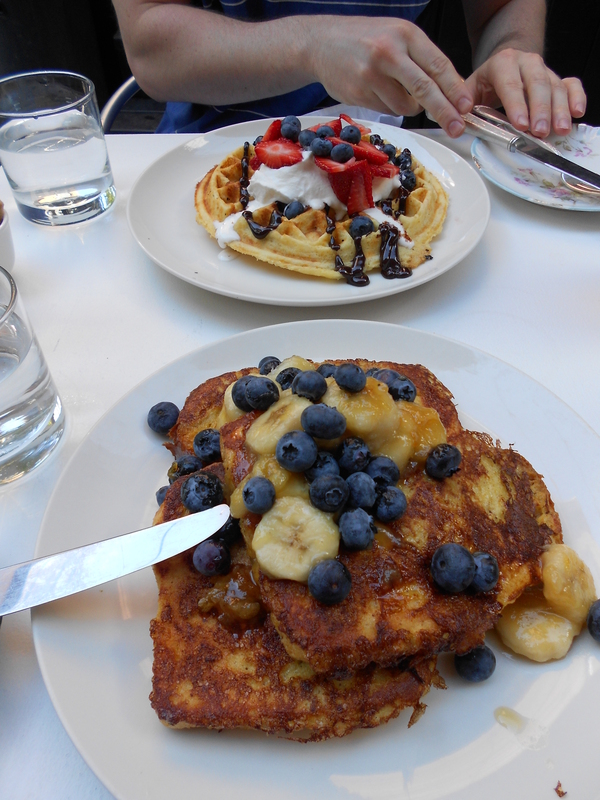 I had my eyes set on the challah french toast despite the threat of ingesting bananas (even caramelized, I hate them). Thankfully the banana flavour had not seeped out and I was able to eat around the dreaded bits. The french toast was amazing, so light & fluffy and topped with fresh blueberries. We traded halfway, Brent got a half order of french toast with a generous heaping of bananas and I got half of a giant waffle with amaretto whipped cream (heavenly) and chocolate sauce and fresh (!!!) strawberries. It was a draw, both dishes were amazing and very well made. Bonus points for having fresh fruit that is in season, there is nothing worse than frozen strawberries. Unless I froze fresh strawberries because I had too many, but even then they are doomed to be smoothies and nothing else. Smith also happened to have the cutest little plates (not sure what they are called, the little ones that are at the table before you get there with the napkin-wrapped fork & knife): they were so beautiful and each table had different plates. 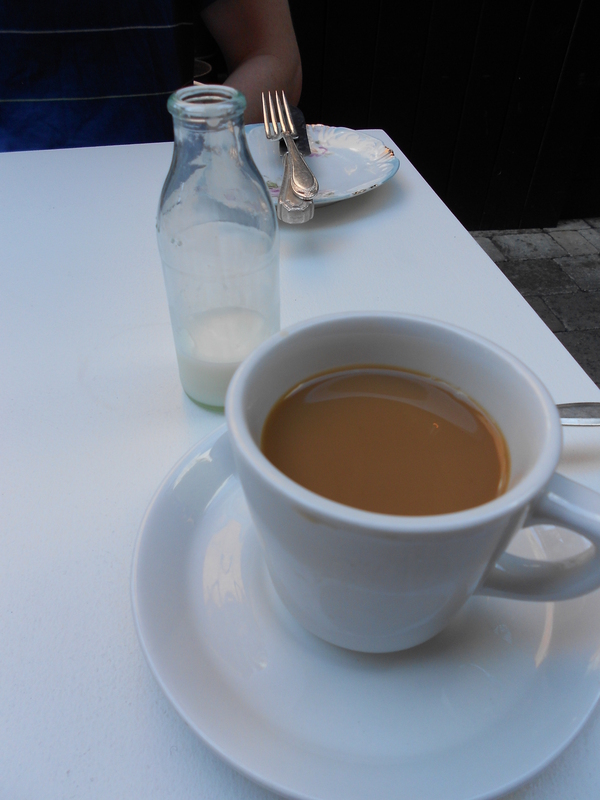 When the waiter brought me my coffee, he brought the milk in…. A TINY LITTLE MILK JAR. I wanted to steal it so freakin’ bad, it was so unbelievably cute and honestly made my day. EDITORS NOTE: I ended up spending more time than I should have, searching for such a bottle to add to my kitchen. Damn you Smith and your cute milk bottle!!! 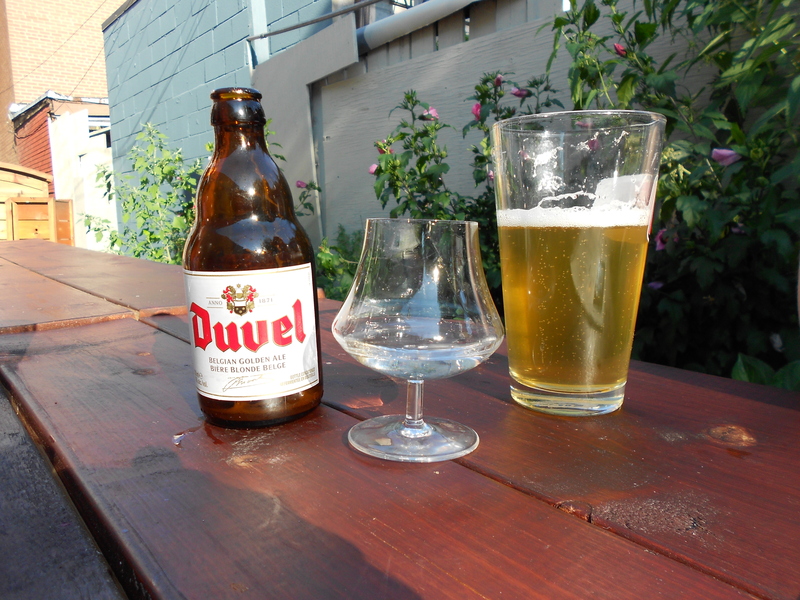 As we walked to La Societe yesterday, clouds started looming and the wind started blowing, a few drops of rain threatened to ruin our nice evening out on the patio, voted best patio for people watching. It is easy to see why it was voted as such, given it is located on Bloor between Bay and St. George a stones throw from Yorkville. 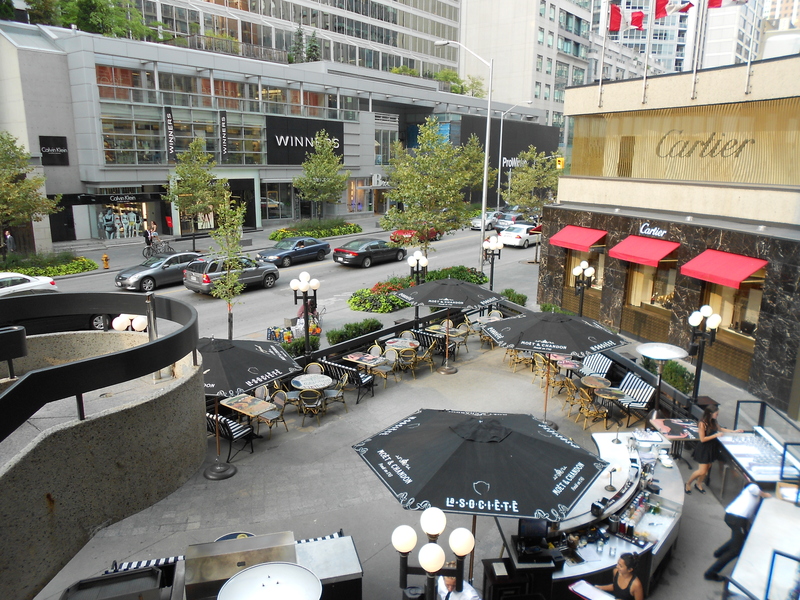 La Societe has two patios, one on street level and one up above looking down. We were lucky that it was not too busy when we arrived (it picked up around 7) and we had our choice of tables. We found one at the farther end of the upper patio with a great view of the street and the patio down below. It was indeed fun to people watch while enjoying our drinks. The wine selection was much better than the beer selection, I lucked out in that they had two types of rose wine, both from France. On the menu I saw that they had frogs legs, and I could not resist, we had to try it. For an appetizer the portion was quite generous, about the size of a main. I dove right in, breaking off a piece and eating it- until I got to the bone. They were not super soft and small like you get in tiny fish sometimes. 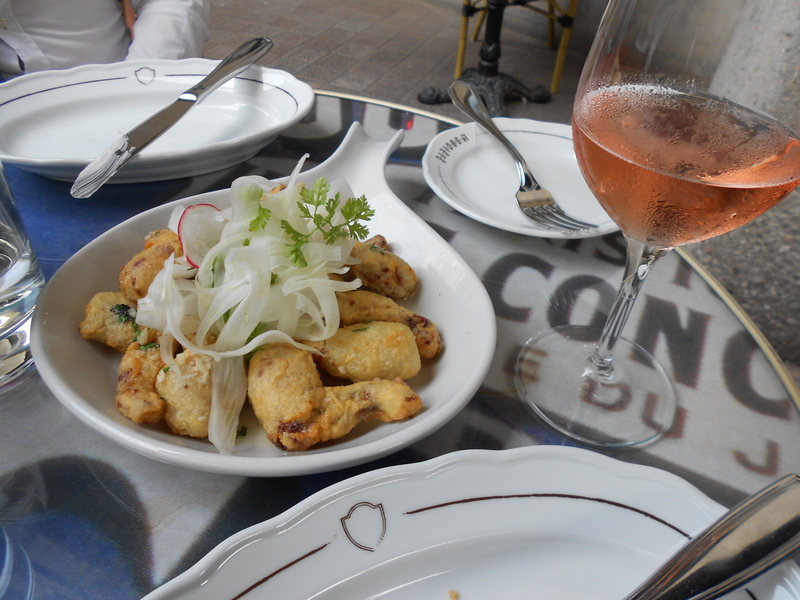 Our fancy French appetizer had quickly devolved to pub fare such as chicken wings. It was so tempting to eat them by hand. Thankfully the meat was such that it nearly fell off the bone anyways, so it was easy to pry off with my fork and knife, keeping it classy. So what does frog taste like? Please don’t kill me but it tastes like a very chewy and slick (greasier?) 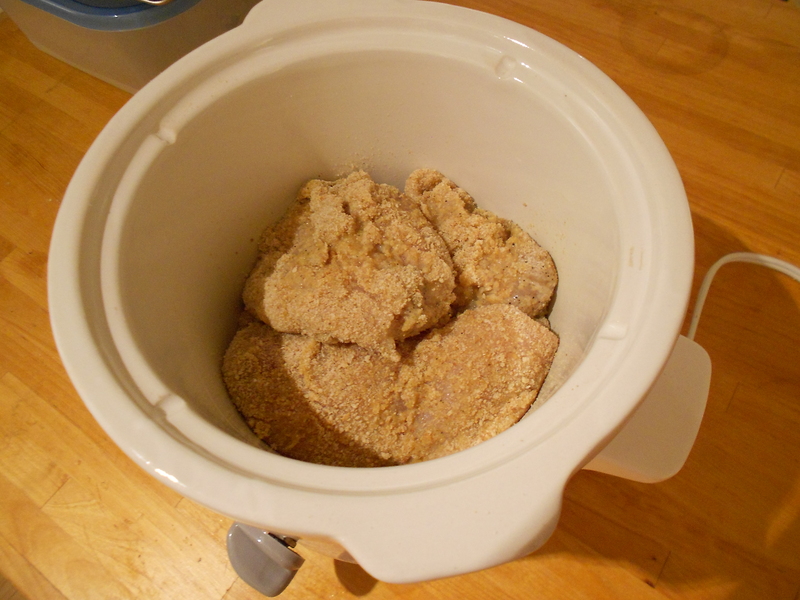 version of chicken. 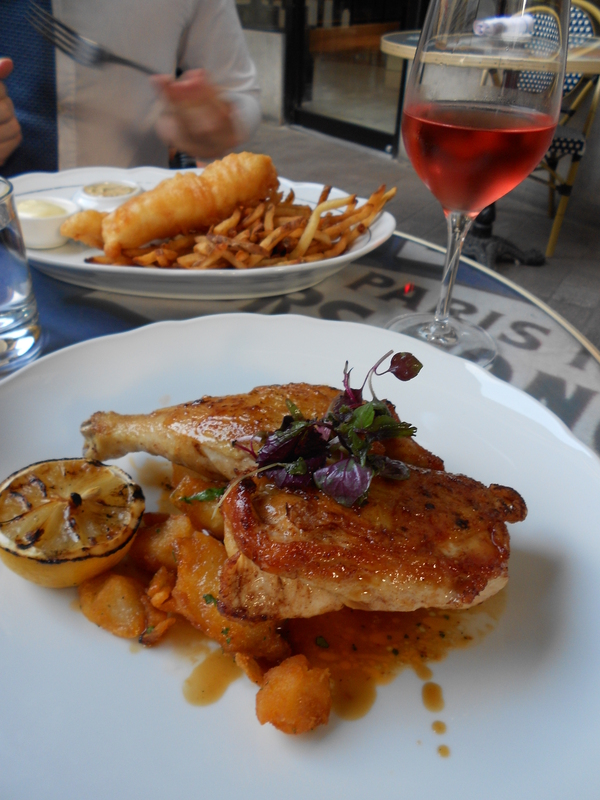 Brent had heard from a co-worker that La Societe had really good fries, so he opted for the fish & chips. I had originally wanted a grilled cheese sandwich, but that was when I thought we’d be stuck sitting downstairs (I really did think it would be busier). The chicken was the only meal that really caught my eye. Plus I wanted to see if my theory about checking the quality of a good chef would pan out: at a fancy (or perceived to be fancy) restaurant order the chicken, as in the most common everyday meat we are used to eating, and see what they can do with it. I made the right choice: it was delicious through and through with a nice crispy skin. The chicken sat on top of the potatoes- soaking them in chicken juice. 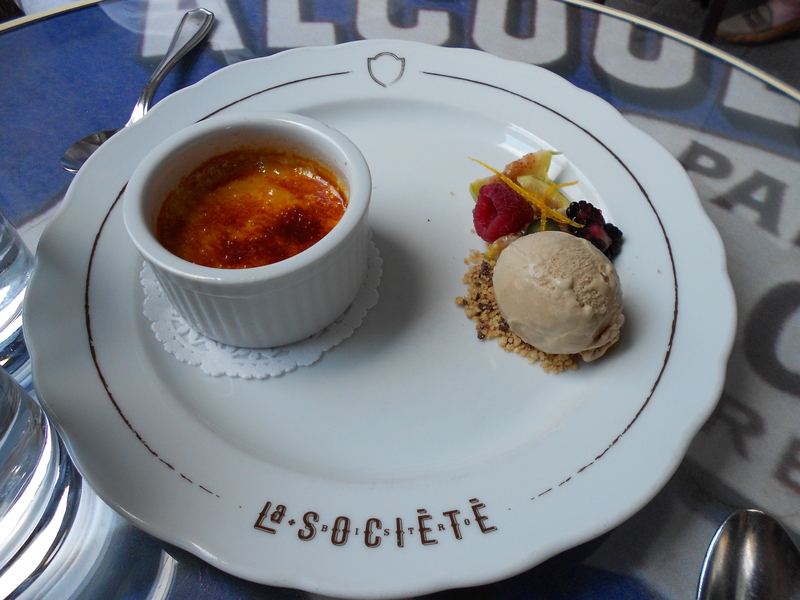 There was no way I was going to pass up a chance to eat creme brulee at a French restaurant. It came with earl grey ice cream on the side, it was good, it tasted like earl grey- though I am not sure why you would want that in the first place. The creme brulee was delicious with a strong vanilla flavour, and it was even still a little bit warm. They also get bonus points for having plates with the restaurant name on it- too cute. We are slowly getting back into the swing of fooding-things, unfortunately this is just as summer is wrapping up. 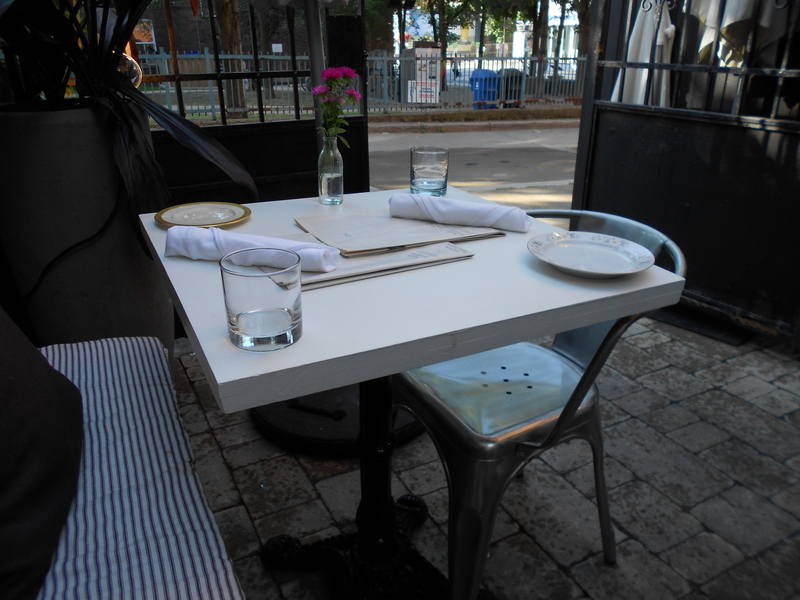 It seems we will soon have a mad dash to all the best patios (there is no way we will get them all by summer’s end). 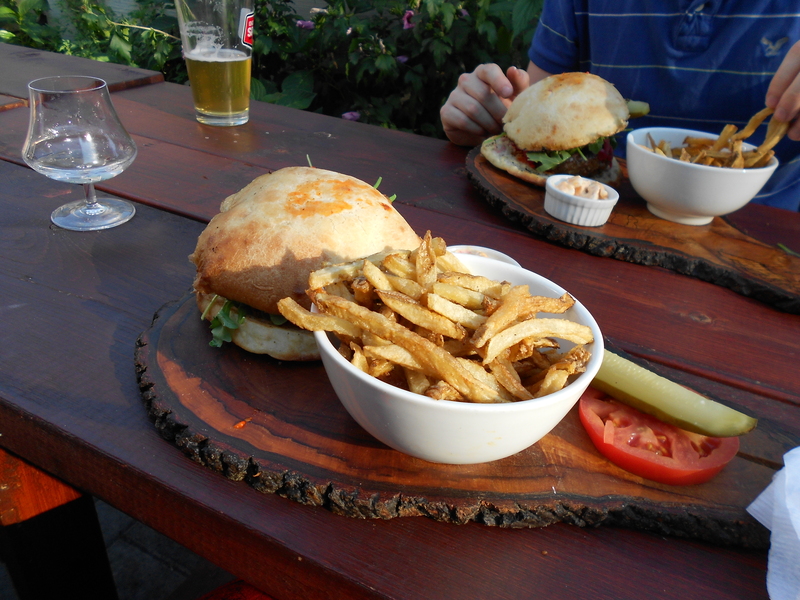 Last Saturday found us at Hrvati, voted best patio on which to enjoy a burger and a pint. We had been meaning to go to this one for a long time now, I was still in school when we first planned on going there. I had originally wanted to get the gulasz (goulash) alas, it was no longer on the menu (that is how long it took us to get around to going to Hrvati). What could I do but order a burger? I was not entirely thrilled at the prospect of eating a burger, I was still in the recovery period from the CNE food building (see previous post). My tune changed once I got about halfway through my glass of Rekorderlig, as my stomach started to rumble all I could think of was food. The patio was nice and thankfully not busy. It is in what feels more like a backyard than a patio, complete with picnic benches and flowers along the fence. It is a tiny bit cramped, and I could see myself hating it if there were more people, but we had the whole bench to ourselves. 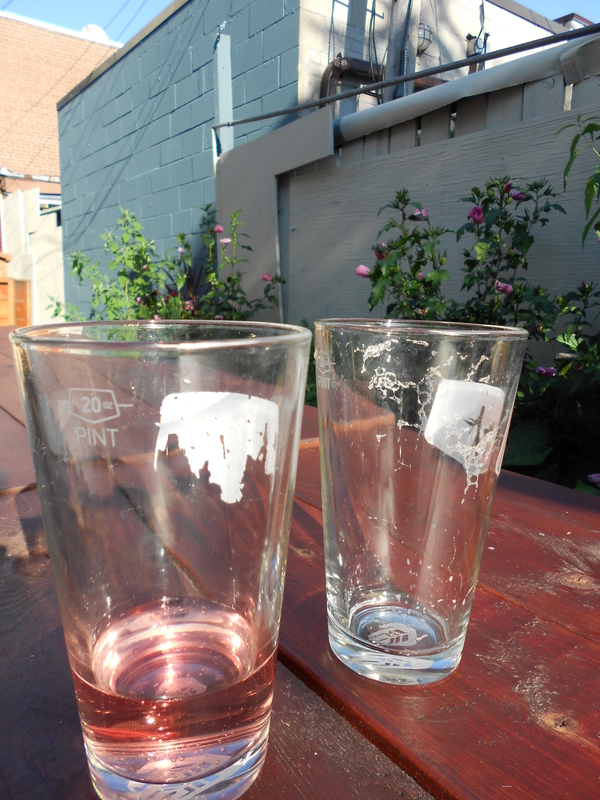 Beer on the patio is a good idea, fruity Swedish cider is not such a great idea. Especially when there are flowers lining the fence around the patio, attracting bees and wasps. I was hoping my cider would be beer-coloured, but when I poured it I was shocked to see how pink it was. Brent laughed that I’d Had it so many times, how could I not know? I didn’t know because I always drank it out of the can. It’s ok, I got to laugh at him when he tried to pour his own beer and ended up with more foam than beer. The burger was OK, but it was not something to rave about and to crave later on. I wish I could have had the gulasz, it’s too bad they took it off the menu. For our second round of drinks I tried to order a plum brandy but was informed that there had been a party there the night before- and they drank it all. The waitress recommended the apricot brandy, and I trusted her (partly because that was the cheapest drink on the menu, and therefore she was not trying to upsell me). Oddly, the real standout was the pickle. It had a slight taste of cinnamon/cardamom (or another spice from that family) that made it uniquely tasty. Once again it is that time of year again, when I stuff my face with food and spend an inordinate amount of money on food. Of course I am talking about the CNE. This year was no exception. I had heard about the Nutella stand a while ago but was not intrigued, not even slightly. Fries? With Nutella? It seemed to me they had run out of original ideas and were just throwing odd things together for oddities sake. The day before the Toronto Star had run a story after media day preview. One of the stand out (if you can call it that) items was the cronut burger from Epic Burger. I had tried a bite of the Krispy Kreme burger earlier this year and it was not that bad. Going on this assumption I thought it translated to cronut burgers. I was wrong. It would have been an ok burger… were it not for the icing sugar. 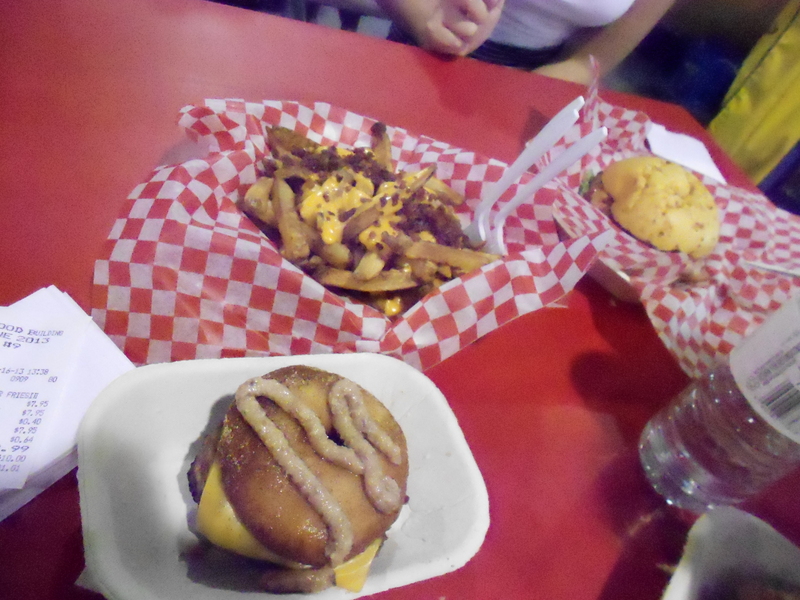 Camilla had the Canuck burger from Bacon Nation. Instead of ground beef for burger patties, they replaced it with ground bacon. And then piled strips of bacon and peameal bacon on top. It was good in small amounts, but I had just eaten a burger patty with cheese (I gave up on the cronut and ate just burger). On the side we split an order of bacon cheddar fries, also from Bacon Nation. I watched the guy make my fries and I knew I was in for little bites of heaven. While it might sound gross to watch someone douse your freshly fried fries with nacho cheese sauce and the liberally sprinkle bacon bits on top- I was really hungry. The cheddar fries were the winner thus far. Alas there was no time for dessert as we were off to see the acrobatic show Tic Toc. 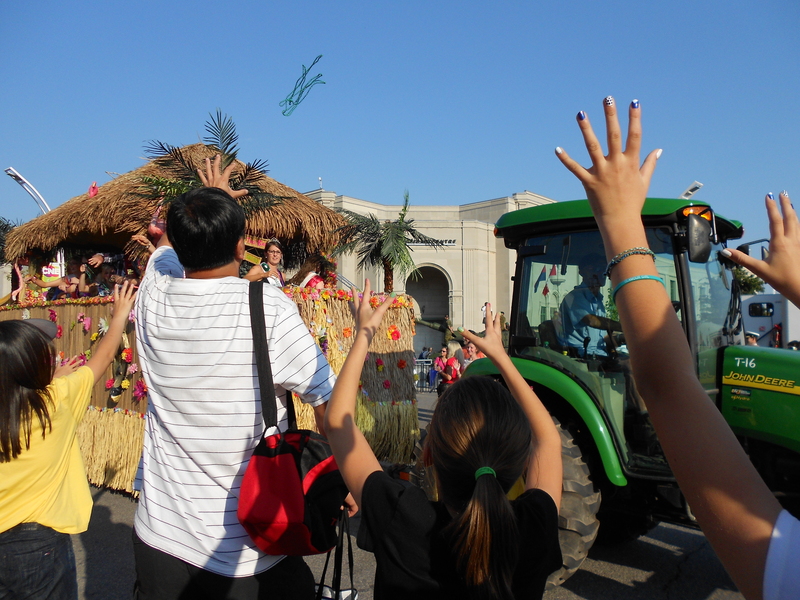 Something weird was going on at the CNE. For starters, Stitches actually had a decent amount of decent COTTON clothes! For the first time ever it occurred to me to ask the individual price of items that are usually sold in bulk (4 nail polishes for $10 and 3 books for $10 being the usual deals). I still cannot believe it took me that long to realize it. Our first break from shopping, a chance to finally sit down, was at the Super Dogs show. Every year I insist on going, and it has yet to disappoint me. I was about to be mad and disappointed (they now advertise during the show for their sponsors- boring) but the Super Dogs dancing to Footloose more than made up for it. Our next break was not until later in the night at the Food Building. I was finally ready to try deep-fried mac & cheese. I had avoided it for years, because it sounded atrocious. Alas, I was out of super-crazy things to try and this was at the bottom of my list. Turns out I was very wrong for having it at the bottom of my list. It was delicious! Except for the last little bits that were mostly just deep-fried batter, occasionally one deep-fried noodle. It was fun to eat and not at all messy. The problem was that by the end of it I was in desperate need of sweet. No desserts had caught my eye, and Camilla suggested Freshly Squeezed. 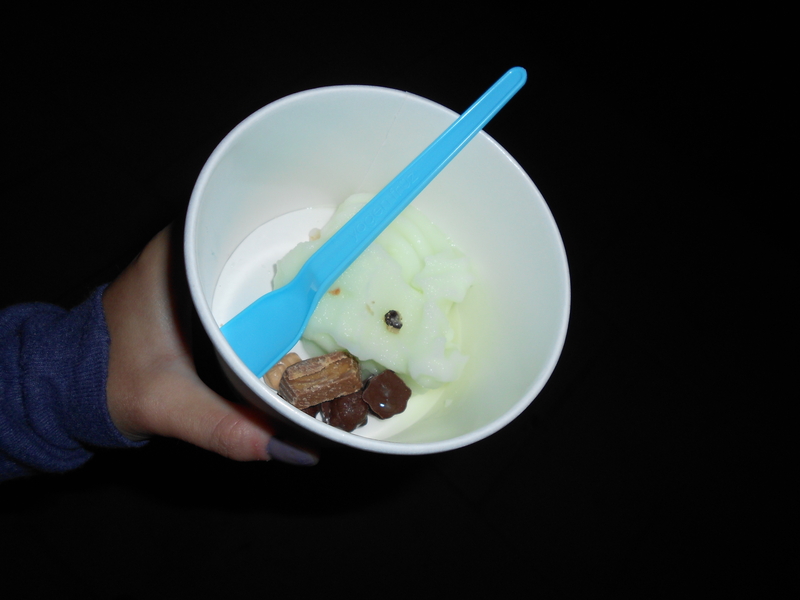 I wandered around until I found that Yogen Fruz now had self-serve frozen yogurt. Even at the CNE, I cannot resist. I was so full though that I got a teeny tiny amount of lime sorbet. The cashier even made fun of me. It was so refreshing though. On our way out we cut through the Arts & Crafts building where I discovered a cupcake stand. Never one to turn down a cupcake, I veered right. My eyes settled on a delicious-looking lemon number. I was a tad wary as they all featured buttercream (blech usually). And so it was. 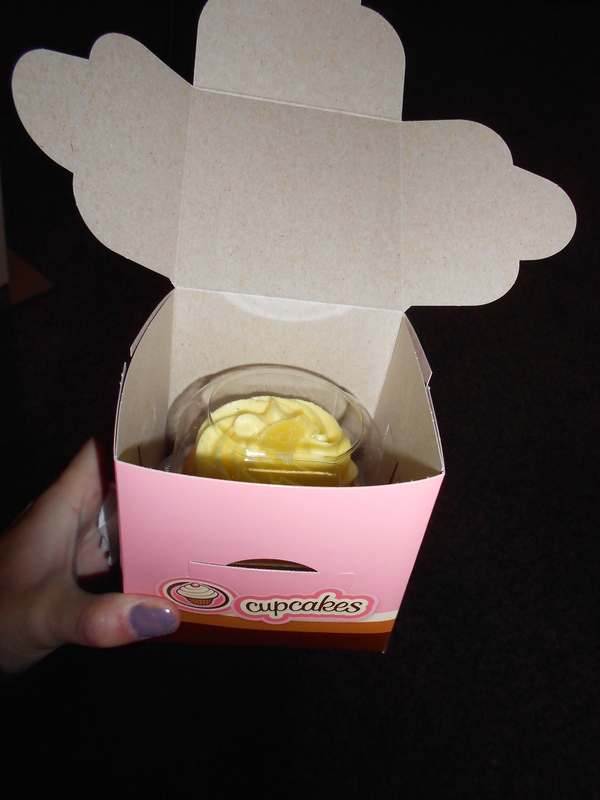 Having overeaten, I was not too happy with the too-buttery buttercream. The cupcake part was good though. Earlier when we wandered around the midway I almost gave in and got deep-fried butter (even now, the thought of it churns my stomach) for lack of anything else deep-fried and new. I feel as though the deep-fried novelty wave has unfortunately waned at the CNE, giving way to odd-ball concoctions like Nutella on sweet potato fries and the like. I am not sure what I will get when I go back. I considered the Behemonth from Epic Burger but now having tasted their burger patties I am not sure. 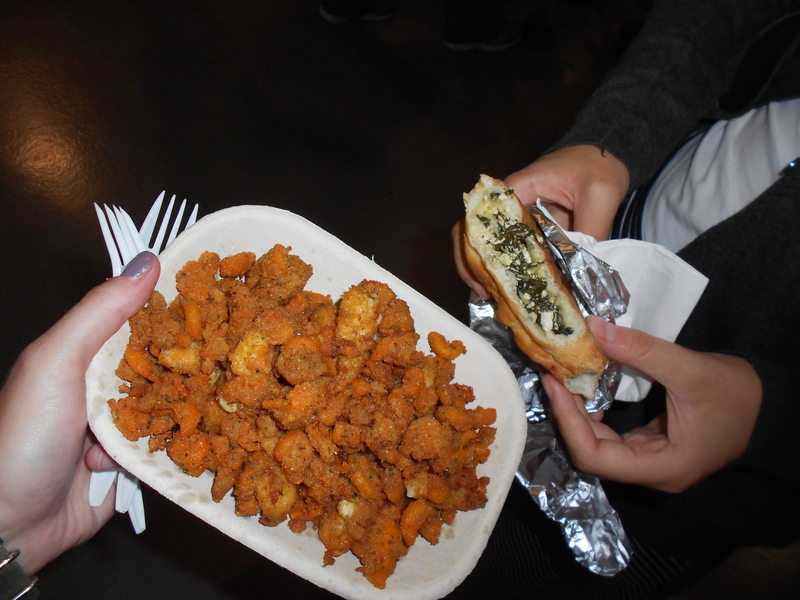 I will definitely be having the chowdah fries from the new food shop Jake’s something or other seafood-y. * While we were eating the deep-fried mac & cheese I pointed out that I had eaten a LOT of various cheeses that day and joked that I would become lactose-intolerant. Camilla mentioned that Lactose IntolerCNE would be a great title, kudos to her. EDITORS NOTE: As you may (or may not have) heard, there was a food-poisoning outbreak at the CNE a few days later, at where else, but the cronut burger stand Epic Burger. I dodged a bullet my friends. I was in desperate need of more freezer space, I had to find room for a dozen bagels that I had gotten for free on my birthday from What-A-Bagel. This was no easy task as my freezer was crammed with chicken (from when my No Frills was closing) and fruit (because I bought a blender). I crammed them in, but every time I went to get something from the freezer there was a looming threat of a frozen-food avalanche. Something had to be done about this. I just so happened to have all the ingredients for Martha Stewart’s Sriracha-Glazed Chicken and Brent just so happened to be out of the country and returning tonight- a perfect excuse to test out the recipe on him, with a surprise dinner. * Even more-so because he loves Sriracha sauce. Loves. You know something has a lot of salt in it when you can smell it, as was the case with the soy sauce. No wonder the recipe does not call for salt, yeesh. As I mixed the ingredients though, a wonderful smell wafted from the bowl. 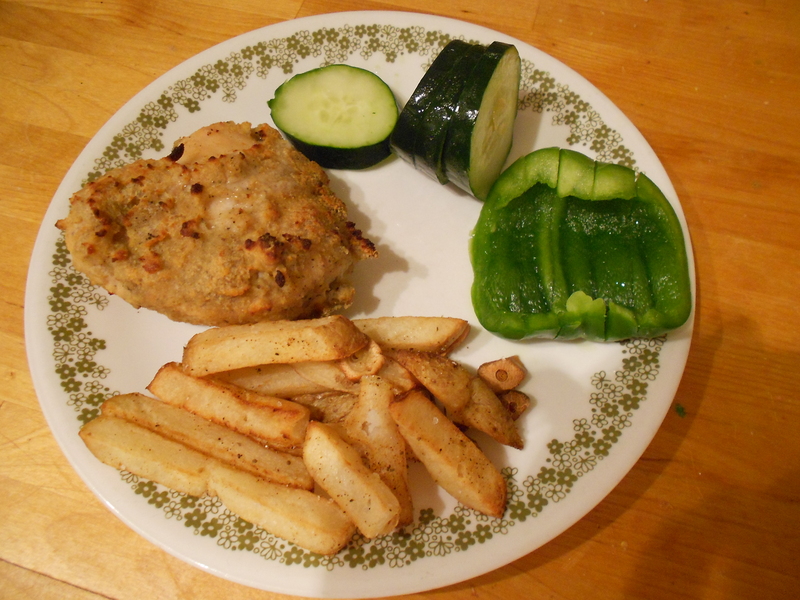 Oh my God, I thought to myself, this might very well turn out as the best chicken ever! It smelled like a mix between barbeque chips and all-dressed chips. I am now craving potato chips real bad. There is a certain anti-climactic aspect to it though. 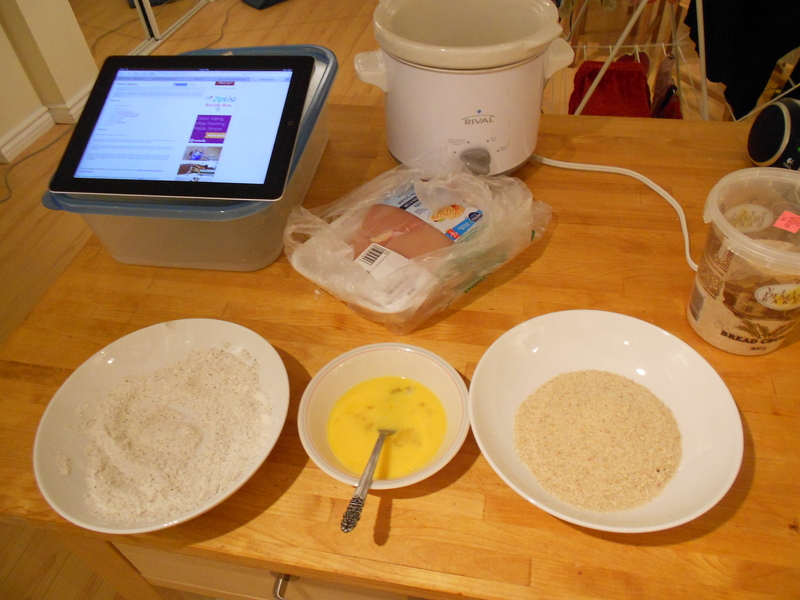 It smells so good, I had all the ingredients- all went well…. and now I have to wait while it marinates “for at least 30 minutes in the fridge.” BUT I AM HUNGRY NOW. UPDATE: it is delicious! Easily a new go-to recipe from now on. *surprise not ruined, he will not have read this until tomorrow. At first when my mom suggested I learn how to make pickles I balked at the idea.Did she not know how much of a disaster I can be in the kitchen?! It’s one thing to cook up some chicken or bake some cookies… but to make pickles?! 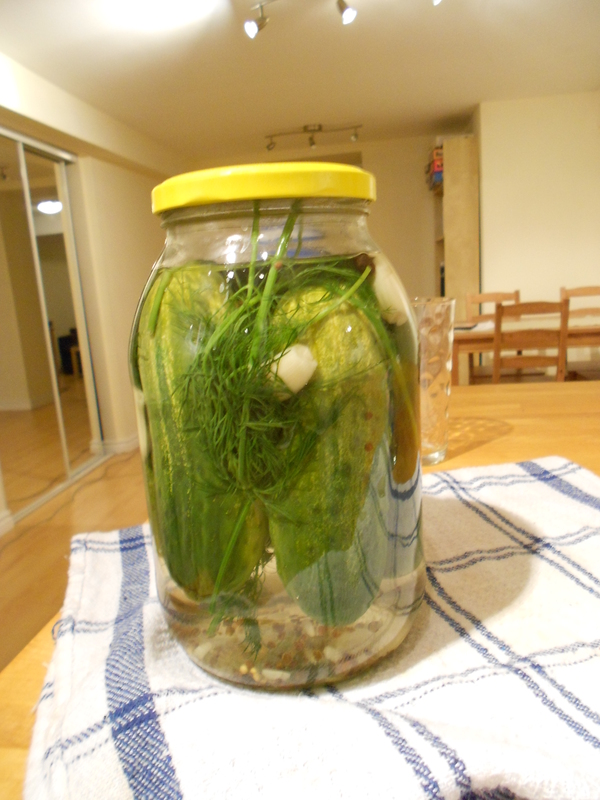 I had yet to venture into the world of pickling and was worried. Rather than wait until next year when the little cucumbers are in season, I decided one day to bite the bullet and try. I had everything set out nicely, I was about ready to go. I had cucumbers, a giant jar, garlic and even some pickling spices I bought at Bulk Barn (I literally bought a pinch, it cost me $0.04, and that is not a typo, that is 4 cents). CURSES! I had forgotten to buy dill. You can’t make Polish-style home-made dill pickles without dill. I was not about to screw this up. I could have used the frozen chopped dill from my freezer, but that didn’t seem right. This called for fresh dill, and I was told it had to be whole stalks. I had to shelve the project for a day. The process itself is simple enough. I worried that the jar might crack, as I had just taken the cucumbers out of the fridge so they chilled the jar. I could see myself pouring the boiled water in and *crack* cucumbers afloat in a river of boiling water all over my kitchen. Disaster. Averted, I should say. I rinsed the jar under increasingly warmer water to slowly warm it. The hardest part was probably the “leave it alone for a week” part. I kept wanting to check on them, see how they were doing. Once they started looking like pickles all I could think of was eating them. So, how did they turn out? Delicious, albeit with a hole down the middle. This is because the cucumbers were a bit old apparently, and I should have (and would have had I known beforehand) soaked them in water first. Boil the water, salt and sugar. Pour it into the jar (there might be some water left over, that’s OK) and screw the lid on lightly. Let it stand for a week. Screw the lid shut and refrigerate. EAT!